Crafted with poplar solids and acacia veneers, this transitional bookcase highlights accommodating style and design. Featuring four shelf areas, the bookcase features a unique back and side panel design. 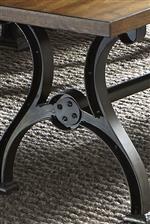 Completed with bottom casters for easy transport, this piece is a wonderful addition to your home office space. The Arlington Open Bookcase with Casters by Liberty Furniture at Godby Home Furnishings in the Noblesville, Carmel, Avon, Indianapolis, Indiana area. Product availability may vary. Contact us for the most current availability on this product. The Arlington collection is a great option if you are looking for furniture in the Noblesville, Carmel, Avon, Indianapolis, Indiana area. Browse other items in the Arlington collection from Godby Home Furnishings in the Noblesville, Carmel, Avon, Indianapolis, Indiana area.